Kumbhat Holographics Private Limited - Retailer of labels with hologram, certificates and receipts with hologram & security lables products since 1999 in Chennai, Tamil Nadu. One of the most demanded product in hologram fields. It retains. All the features of a Printing Labels and have the effects and security of Hologram. 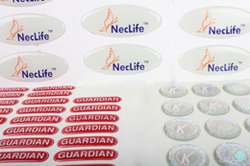 The Hologram can be affix on the label by a hot or Cold Stamping Process. Now a must for all certificates and cash receipts, Event Tickets / Passes to have Hologram affix on it to make itauthentic. 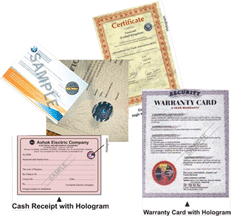 Hologram Enhance the security features of a certificates and receipts. With the growing menace of counterfeit and brand duplication, the need to use security labels has become necessary. We offer a variety of customized security solutions which are designed after careful deliberations between the end use, converter and user. 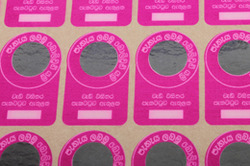 we also do offer some "void" material destructive label stocks, Transfer labels etc. 2D / 3D Holograms - 2D/3D holograms can be produced with two or three levels of depth and are ideal for corporate identity items. They are generated from conventional Line artwork and give spatial effects with vibrant color changes. 3D Holograms – Laser originated from models, still life objects or living subjects, they give full depth renderings of products, popular icons (e.g. Cartoon characters, religious figures) symbols, logos, campaign mascots, rare artifacts etc. Paper & Board – Available in ranges varying from 15gsm to 220 gsm board they can be supplied in rolls or sheet, with or without adhesive. Polypropylene – Available in several gauges and widths, heat – seal grade, single / sandwich layer lamination. The Hologram are in a continuous roll or strip from. Mainly used to affix hologram continuously by using automatic applicator machine. Hologram security tapes can be customized for use in any type of security application (government, military, industrial, commercial). They indicate “evidence tamper” or show that the product or package has been opened or tampered with. Hologram tapes (Hologram security seal) offer an effective combination of security and attractive appearance. The customizable, hidden text which just can be read by laser reader can be used for both anti- counterfeiters. Custom designed Holographic hot stamping foils have registration marks which are traced by hot stamping machine when transferring Holographic image onto paper, PVC card, Smart Card ect.. Since the underlying information can be see through the Transparent hologram label. It is also an affordable method of re-validation an existing ID card. Instead of printing new ID cards each year, simply peel and stick the transparent hologram label (or overlay) onto an existing ID card. The holograms in general design as ORIGINAL, AUTHENTIC, SECURE, can be made in different color base material. These photos are holograms labels made of silver color tamper evident base material. To increase security, it’s good to make pressure sensitive tamper evident (temper-proof) self-adhesive holograms with pattern released feature material which will leave word as ‘VOID’,’ORIGINAL’ when peeled off. It’s also great to make sequential numbers (transparent or black) on these holograms. These holograms are available to be cut into smaller size. You can choose holograms without paying hologram master origination charge freely. Tampering with the packaging of food or health items may cause more hazard than that with non edible goods, and therefore, we have developed a self-destructive hologram in a form of sticker label that easily breaks off once peeled. Holographics shrink sleeves are highly demanded in the market today. Holographics shrink sleeves are applied on the necks of bottles as an additional security seal. These sleeves can a holographics tear strip running through it. Once the strip is pulled of, it cannot be replaced. Holographics shrink- sleeves are considered to be a fast-growing segment in the labels market. Scratch hologram is widely used to cover Pin codes for the banking, mobile cards, discount coupons, password, etc on mobile card, member shipment card, lottery, ticket, bank document, etc, for high security purposes. The hologram image improves security ability of scratch coating greatly instead of normal scratch coating which is used for mobile cash cards or gift coupons usually. Holographics image is directly embossed on the surface of aluminum foil. It’s good solution to emboss hologram onto the packaging medicinal tablets panel. It improves the appearance of packaging greatly. The hologram foil can be embossed maximum in width of 160mm. It’s embossed by hologram nickel shim which is very cheap solution to make hologram. Transparent Hologram Overlays for I.D. Cards using a transparent hologram film overlay on digitally printed ID card protects the inks from excessive abrasion and wear, which extends the card life and enhance the security of your ID card. The holographics overlay prevents alterations to the ID card information and combats copying or duplicating the ID card. Promotional holograms can be used for advertising & sales or brand promotion. They can also be used as give away in trade fairs, as mementoes, keepsakes, tokens and on magazines, brochures covers, greeting cards. Multi colored 3 dimensional images of deities, places of worship, monuments, palaces, edifices, structures, buildings of historical or archaeological importance can be replicated on different surfaces. Full-color holograms on glass plates serve as exquisite exhibition pieces and presentation plaques.